I believe I already mentioned that French Bulldog Village is in a bit of a cash crisis. I’ve been brainstorming fund raising ideas for them, and thought it might be fun to do a photo book. After all, what’s more photogenic than a French Bulldog? Two things that I’m curious about – are people more likely to buy a book if it has a photo of their dog in it? If so, do you charge them for putting their photo in? I think you do, if it’s a book devoted to kennels or show winners, but not if it’s photos of pets. What do you think? Assuming you’d personally buy a copy of a book if it was designed to raise money for rescue, which book would you be most likely to buy? There’s a poll below – please leave me your feedback. Which fund raising book would you buy? Are you artsy? Crafty? Use it to help French Bulldogs! Are you an artist? A craftsperson? A photgrapher? Do you make beautiful things or design beautiful art? If you answered yes, and you also love French Bulldogs, then the French Bulldog Village needs your help. Breed rescue isn’t cheap, and breed rescue in Frenchies, with their esoteric health needs, byzantine genetic conditions and specialized Veterinary requirements is bankruptingly pricey. The French Bulldog Village might be the new kids on the block when it comes to helping French Bulldogs in need of rescue or adoption, but that hasn’t stopped them from tackling the tough cases – the expensive cases. But this can’t – and won’t – continue without some help. If you’re an artist, or a graphic designer, can you donate a design – an original piece of artwork, in digital format? 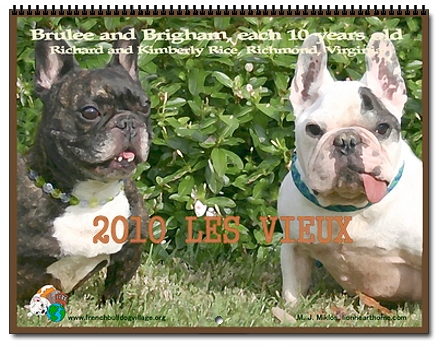 It will give the French Bulldog Village new designs to sell through Cafe Press, and in return you’ll get a full page spread on the Village (and on French Bulldog Z, and on this blog), not to mention the undying gratitude of legions of sad faced, needy little Frenchies. Delilah is sad because you haven’t donated…. Are you a craftsperson? Can you donate a one of a kind item to the Village for them to auction off? Anything at all will do – it doesn’t even have to be French Bulldog specific, although if it is, that would be nice, too. Do you do something else, make something else – anything that can help to raise funds for the Village? Will you donate a training session, or a Pet Psychic session, or a ride in your helium balloon, or… well, anything? If the answer is yes, then email Rebecca, and tell her I sent you. Look, don’t make me run a “If you don’t donate, we’ll shoot this Frenchie” type ad, because I will so do it, I swear. If you don’t make things, or have things, or want to get involved, could you at least donate a couple of bucks? Pretty please? Do it for all the sad eyed puppies… or bad karma will haunt you forever. https://i0.wp.com/www.bullmarketfrogs.com/wp-content/uploads/2015/04/Brindle_pied_frenchbulldog.jpg?fit=662%2C662 662 662 frogdogz http://www.bullmarketfrogs.com/wp-content/uploads/2015/06/bullmarket-logo.png frogdogz2008-08-01 20:10:152008-08-01 20:10:15Are you artsy? Crafty? Use it to help French Bulldogs! Hey, have you been looking for a super deluxe, pre spoiled, ready to install lapdog v. 2.0? One with most of the bugs already worked out? One that’s been field tested and approved for day to day family snuggling and cookie eating? Admit it – this is the dog you’ve been waiting for. The sweet, gentle, people-loving Frenchie who will cuddle up with you on the couch while you eat popcorn and watch movies, read a good book, or take a nap. Who knows, maybe she’s a sports fan? She loves her people, so whatever you like to do will be just fine with her, as long as it isn’t too athletic. Lola is a friendly and outgoing girl who likes children, other dogs, and pretty much everyone she meets. She would, however, prefer to be your only furry resident; at her age, she doesn’t want or need to be pushed aside by the younger crowd. A home with one or two good natured dogs would probably be just fine. 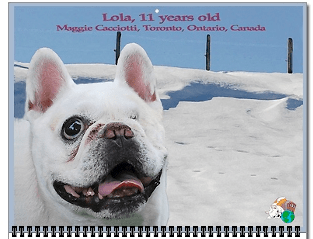 Lola is one of the luckier Frenchies on the French Bulldog Bus. Until now, she had a loving home. Her owner wishes she could stay, but he has to move where pets are not allowed, so sweet Lola needs to find a retirement home of her own. It’s tough to be uprooted when you’re an older girl, but Lola’s taking it like a champ. Her sweet personality keeps shining through. There’s a little grey around her muzzle but her heart is pure Frenchie gold. Lola’s always been a good girl and she’s in good health. Well, maybe a little “middle-aged spread,” but nothing abnormal. She does take thyroid pills every day but it’s a very inexpensive medication, and she takes her pills without any fuss. She’s up to date on her veterinary care. Lola has been well cared for all her life, and she has no known traumas or illnesses. She’s just, like the rest of us, getting up there in years. Lola has excellent manners, with crate training and house training under her belt. She has the ability to slip into your household and settle down as comfortably as if she’s always lived there. Lola needs a loving forever home to put her Frenchie feet up and nap next to a nice warm human being. She’s a lovely brindle girl and very photogenic and would be delighted to pose with you on your next set of holiday cards. Don’t you need a cuddly Frenchie to snuggle with? Lola is waiting for you! Come on, you know you have room for one more Frenchie on your lap. Lola is a little old lady who just wants a chance to live out her life in a peaceful, loving home. If you’re that home, then go on over to the French Bulldog Village and fill out an application form. Poor little Fluffy. She might not be the prettiest dog on the block, but didn’t your momma teach you that pretty comes from what’s on the inside? And this girl’s got a pretty nature that shines on through, in spite of all the trauma she’s experienced in her life. A puppy mill rescue, Fluffy (now known as “Peaches”) came to rescue with a myriad of health issues, most baffling of which was – her poor little bum was sewn shut, apparently to deal with her diahrrea! Good grief! There’s suspicion it was done as a shoddy attempt to correct a rectal prolapse, but no one knows for sure, and Fluffy isn’t talking. She still has some leaky bum issues, and is getting paranoid about anyone coming up behind her, because she is (quite understandably!) getting tired of being swiped with baby wipes every two minutes. Her poor little bottom is still red and sore, in spite of the special diet and special care her foster mom is putting into her. Still, she’s a Frenchie – sunny natured, happy to be alive and loved, and adoring every pat and kiss she gets. You can read her latest updates over on the French Bulldog Village Blog. Is there anything more resilient than the heart of a rescue dog? No matter the beatings, no matter the neglect, no matter the horrific abuse, time and time again we find that underneath it all there’s a heart that still wants – desperately – someone to love. Adopting, fostering or even just supporting a rescue dog isn’t something you do because it’s ‘noble’ – you do it because it’s one way to show these dogs that their resiliency in the face of horror, their willingness to try once more to love us, isn’t misplaced. It’s how we show them that, yes – there is goodness in the world. Someone once said to me “Rescuing a dog is like picking up some dull, dirt encrusted rock, only to buff it up and find that it’s actually a priceless diamond. Under all their filth and neglect, someone’s priceless new best friend is hiding”. Go find your own priceless new best friend, over on the French Bulldog Village. Yes, I’ve mentioned them before – but now I’m mentioning them again. They do good works, every day – placing stray “French Bulldog mixed with who knows what” mixes, adopting out puppy mill retirees with no questions asked, helping breeders place their dogs into great retirement homes, and staying out of the politics of “Should we help that person?”, because they know that what matters is the dogs. They’re also the home to the Karen Krings Memorial Fund – a fund dedicated to helping special needs French Bulldogs in the care of rescue organizations. Check them out, and toss them a few bucks, even if you can’t adopt one of those adorable little faces. Oh, and check out FBV founder Charlotte Creeley’s new blog – attorney stuff, dogs, dog training, pugs and other bits and pieces. 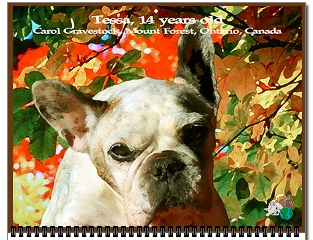 She’s a great writer, and a true supporter of French Bulldog welfare.